Among all other crises, the scarcity of water is among the gravest issues Pakistan is facing, which can impact Pakistan’s national security in the future. According to a report by the International Monetary Fund (IMF), Pakistan ranks third in the world among countries facing acute water shortage. Experts inside and outside Pakistan, believe that Pakistan is on its way to becoming the most water-stressed country in South Asia by the year 2040. The storage capacity of two mega dams of Pakistan at Terbela and Mangla is falling because of silting and sedimentation. These mega dams can store only 30 days of average water demand compared to 120-220 days for India and 900 days for the US. Pakistan Council of Research in Water Resources (PCRWR), a body which played important role in promoting research in various disciplines of the water sector, reported in 2016 that Pakistan touched the water-stressed line in 1990, while it crossed the water security line by the year 2000. 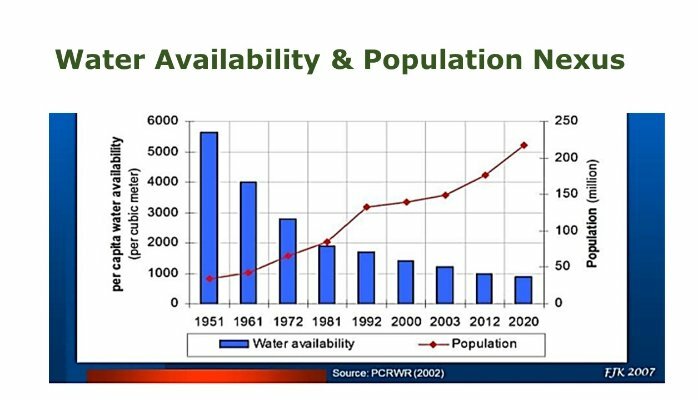 The PCRWR also warns that Pakistan could run dry by 2025 because of the water shortage would reach an alarming level. According to Muhammad Khalid Rana, a spokesperson for the Indus River System Authority (IRSA), Pakistan receives around 145 million acre-feet (MAF) of water every year but can only save 13.7 MAF. Pakistan needs 40 MAF of water but 29 MAF of our floodwater are wasted because of the lack of water storage capacity. New Delhi raised this issue with international bodies, arguing that it should be allowed to use the western rivers — Indus, Jhelum, and Chanab, which are, according to 1960’s Indus Water Treaty (IWT) between India and Pakistan, where it was agreed by the two parties that India would use the eastern rivers, Satluj, Ravi and Bayas, while Pakistan would use the western rivers, Indus, Jhelum, and Chanab — because Pakistan can’t use them properly. According to reports, in the rate of water use, Pakistan has the world’s fourth-highest ranking and world’s highest amount of water, in cubic meters, used per unit of GDP (Water Intensity Rate). This is because, in Pakistan, agriculture is the backbone of its economy. The agriculture sector provides 47% of the total employment and 70% of the exports are agriculture-related. The agriculture cannot flourish and sustain with the scarcity of water which highlights the need for water reservoirs. Besides the lack of water reservoirs, experts believe that the water scarcity problem also got severe because of the population growth and urbanization. According to IMF report the per capita annual water availability 1,017 cubic meters in 2018 – very close to the scarcity threshold of 1,000 cubic meters — compared to 1,500 cubic meter in 2009 and 5,260 cubic meters in 1951. The poor water management and climate change further exacerbate the issue. The Mangla dam was built with a reservoir capacity of 5.88 MAF, however, by 2005, the capacity was dropped to 4.67 MAF because of the sedimentation. Experts believe that the capacity would further deteriorate during the years to come. The Mangla Dam Raising Project was started in 2004 effectively raised the dam height by 30 feet which increased the dam’s storage capacity by an additional 2.88 MAF. In the 1960s, another big dam was built at the site of Terbela in Khyber Pakhtoonkhwa (former NWFP). The dam was built with an initial reservoir capacity of 9.7 MAF, which is reduced almost one-third of the capacity due to silting and sedimentation. The estimated lifespan of the dam is until 2060. To resolve the water crisis, many experts in Pakistan believe that besides the upgrading of current dams, Pakistan requires to build mega-dams. First on the list – which is also heavily discussed nowadays – is Diamer-Basha dam in the Gilgit-Baltistan area. The initial design consists of 892 feet high spillway with 14 gates with a storage of 6.4 MAF. Although, this multipurpose dam would deliver many benefits like added storage capacity to ensure water from the Indus is more reliably available throughout the year, flood control to help prevent the devastation which was seen during the year 2010 and last but not least, generation of low-cost hydroelectric power to help address the country’s power problem. However, according to experts, the total cost of the dam is estimated to $14B, and the fear is that it would at least be doubled by the time dam is complete, because according to the World Commission on Dams (WCD) — which provides the most accurate and comprehensive guidelines for dam building — on average, all dams suffer at least double the cost than the initial estimate. In Pakistan, the Neelam-Jhelum project suffered 5 times more costly than its initial estimate. So, as per WCD’s estimate, the Diamer-Basha dam’s cost would go at least $28B, which is almost 10% of Pakistan’s total GDP. Another problem which geologists warn about is that the dam site lies at the plate boundary between the Indian and Eurasian plates. The Water and Power Development Authority (WAPDA) of Pakistan recognized that fact in their feasibility study that the site is traversed by multiple fault lines. 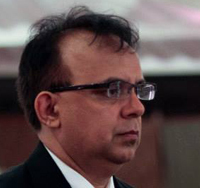 Bashir A. Malik, the former Chief Technical Advisor at the United Nations and World Bank, also worked as Director Tarbela Dam Indus Basin Project and one of the most ardent supporters of dam building in Pakistan, also wrote many books including the famous “Indus Water Treat in Retrospect”, had stated that the risk of earthquake-induced failure at the Diamer-Basha dam site is too great to carry on with construction. The WAPDA’s data also reveals that there is not enough water in the system to sustain additional large dams. For example, for 90 percent of the time, the flow of Indus below Kotri amounts to less than 5 MAF. It is only the sporadic flood years that give them a satisfactory number of 35 MAF. Sindh government claim that to prevent the “seawater intrusion”, 10 MAF water is required under the Kotri Barrage, However, in 2004, the federal government hired experts from all over the world who undertook the study and concluded that 3.6 MAF is required under Kotri Barrage to contain the seawater intrusion. So, the experts ask, is this feasible to spend that much energy and funds just in one project? With an estimated cost of $14B, Pakistan requires solid commitment, from international financial institutions such as the World Bank and the Asian Development Bank, instead of relying on the individual donations which reach some $55.5M as of November 1, 2018. There are reports, that some potential donors want to use it as an opportunity to avoid taxes against the donated funds, and the Cabinet is wasting time in finding out ways to make them donate. Because of the controversies about its location which inside the disputed territory and its geodynamic surroundings, the international financial institutes are not showing too much interest. Brazil and China, which are rapidly growing economies, are utilizing domestic funds to build their mega-dams. Pakistan cannot follow the suit. However, the World Bank supported smaller projects like the extension of a hydropower project at the Terbela Dam, agriculture productivity improvement projects and Sindh Barrages Improvement Project. Pakistan should plan small dams and get help from financial institutions. Pakistani private media can play a significant role in educating the masses and creating awareness about the conservation of water resources. Instead of childish propaganda about the efforts to collect donations, media should have discussions and debates about the pros and cons of mega dam vs small dam. People must be educated and made aware of the fact that the first step to conserving water would start from the individuals. The government must be pressurized to make concrete steps towards planning dams, upgrade the irrigation systems, improve canal systems and other scientific ways of extracting water from the air. The government must take the problem head-on instead of worrying about the optics and politicizing the whole issue and educate people about the options available and which option they can use. Michael Kugelman, South Asia expert at the Washington-based Woodrow Wilson Center, told Deutsche Welle (DW), a Germany’s public international broadcaster, “Pakistan is approaching the scarcity threshold for water. What is even more disturbing is that groundwater supplies — the last resort of water supply — are being rapidly depleted. And worst of all is that the authorities have given no indication that they plan to do anything about any of this. Kugelman said, “The Pakistani authorities need to step up efforts to overcome the water crisis, which is partly man-made. First of all, Pakistan’s leaders and stakeholders need to take ownership of this challenge and declare their intention to tackle it. Simply blaming previous governments, or blaming India, for the crisis won’t solve anything. Next, the government needs to institute a major paradigm shift that promotes the more judicious use of water,” Kugelman emphasized.